Janardhanan Vembunarayanan (Jana), a long time Safal Niveshak tribesman, recently attended Warren Buffett’s 2013 shareholder meeting in Omaha. He sent me his notes from the trip, which I requested to be used on the Safal Niveshak website. Jana agreed, and here are his (unedited) notes from his trip to Omaha. In 2006, I got interested in investing. I read a lot about Warren Buffett and his investment style. I wanted to become a shareholder of Berkshire Hathaway and attend the shareholders meeting. Finally in Jan. 2012, I purchased the Class B shares. In 2013, I got an invitation to attend the shareholders meeting and I was on my way to Omaha. It was a dream come true after 7 years. I landed in Omaha on 3rd May around 2:00 p.m. I checked into Travelodge hotel and immediately headed to ‘3555 Farnam Street Omaha, NE 68131’. Why? It is the headquarter of Berkshire Hathaway. I could not get into the building but I took a picture of the address. I can see my reflection on the address! 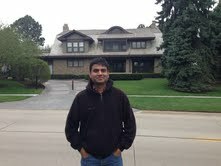 Then I went to ‘5505 Farnam Street Omaha, NE 68132’, where Warren Buffett lives. It is about 2 miles from his office. He purchased the house in 1958 and it costed him US$ 31,500. I did an estimate on Zillow and its value is around US$ 709,433 now. In 58 years, the compounded growth rate comes to 5.83%. It is a single family home with built up area of 5,830 sqft and the lot size of 31,363 sqft. It is me standing in front of his house. I headed to the shareholders reception which was in ‘Boreshims’, a Jewellery shop and a subsidiary of Berkshire. Shareholders were busy purchasing jewellery and they were partying as well. The place was electrifying. I’ve never made the least effort to predict short-term swings in macroeconomics. When things are awful, I predict that some day they will be better. When things are wonderful, I predict some day they will be awful. But apart from those general feelings, I never try and predict. I think it’s a waste of time. Well, I think the long term investor is not too much affected by things like the flash crash. That said, I think it is very stupid to allow a system to evolve where half of the trading is a bunch of short term people trying to get information one millionth of a nanosecond ahead of somebody else. It’s legalized front-running. I think it is basically evil and I don’t think it should have ever been allowed to reach the size that it did and I now see that people are starting to talk about cutting it back. Why should all of us pay, a little group of people, to engage in legalized front-running of our orders? A banker who’s allowed to borrow money at x, and loan it out at x + y, they will just go crazy and do too much of it if the civilization doesn’t have rules that prevent it. They are like heroin addicts. Had a great sleep after watching the video. On May 4th, I went to ‘Century Link Center’ to attend the annual meeting. I was there at 7:00 a.m. expecting to get the front seats. The front rows were full and I had to go all the way back. Peter Bevelin is the author of one of my favorite books ‘Seeking Wisdom’ and I had the privilege to meet him. Buffett lobbies for the role of the villain in “Terminator 5”, but Charlie Munger gets it instead. Buffett’s testament on Salomon Brothers. Lose money for the firm I will be understanding. Lose a shred of reputation for the firm and I will be ruthless. Munger: I have no comment whatsoever on Bitcoin being some kind of universal currency. Buffett: Of our $49 billion, we haven’t moved anything into Bitcoin. Next day on May 5th on the way to the airport I went to Nebraska Furniture Mart. It is a subsidiary of Berkshire and is the largest home furnishing store in America. What is so special about this store? Read the Excerpt from Buffett, 1983 Annual Letter. Even Pascal would have left the room for Mrs. Blumkin. About 67 years ago Mrs. Blumkin, then 23, talked her way past a border guard to leave Russia for America. She had no formal education, not even at the grammar school level, and knew no English. After some years in this country, she learned the language when her older daughter taught her, every evening, the words she had learned in school during the day. In 1937, after many years of selling used clothing, Mrs. Blumkin had saved $500 with which to realize her dream of opening a furniture store. Upon seeing the American Furniture Mart in Chicago ‐ then the center of the nation’s wholesale furniture activity ‐ she decided to christen her dream Nebraska Furniture Mart. She met every obstacle you would expect (and a few you wouldn’t) when a business endowed with only $500 and no locational or product advantage goes up against rich, long-entrenched competition. At one early point, when her tiny resources ran out, “Mrs. B” (a personal trademark now as well recognized in Greater Omaha as Coca‐Cola or Sanka) coped in a way not taught at business schools: she simply sold the furniture and appliances from her home in order to pay creditors precisely as promised. Omaha retailers began to recognize that Mrs. B would offer customers far better deals than they had been giving, and they pressured furniture and carpet manufacturers not to sell to her. But by various strategies she obtained merchandise and cut prices sharply. Mrs. B was then hauled into court for violation of Fair Trade laws. She not only won all the cases, but received invaluable publicity. At the end of one case, after demonstrating to the court that she could profitably sell carpet at a huge discount from the prevailing price, she sold the judge $1400 worth of carpet. I boarded the flight around 2:45 p.m. back to California. On the way back I immersed myself into the book ‘Predictably Irrational’ written by ‘Dan Ariely’. This is one of the best books in Behavioral Economics and Decision Making. To the left of me I saw a passenger reading a report on ‘Coca Cola’. I sneaked into the report and saw words like Buffett and Munger. Out of curiosity to find out what the report is, I introduced myself as a Shareholder of Berkshire. I asked him what report he is reading. It was ‘1988 Valuation of Coca-Cola’ by Bud Labitan. I came back home at 7:30 p.m and ordered the copy of ‘1988 Valuation of Coca-Cola’ by Bud Labitan. Thank you Jana! I can imagine the great time you must’ve had on this pilgrimage to Omaha. Anyways, here’s the transcript of 2013 Berkshire meeting as shared by another tribesman, Manish Sharma. Thanks Manish! Thank you Vishal and Jana. Looking back, I am sure this would be one of Jana’s ‘moments of joy’. If I am not mistaken, you also have a side business related to content writing ? Just wondering if there could be opportunities to collaborate. Happy to discuss. Almost thru the first read of the magnum opus of Taleb – Infragility. Probably needs many reads and discussion with like-minded folks to fully grasp his wisdom. Lots of areas were a total bouncer. One needs a lot of patience as he tends to meander around too often ( I read he has done this consciously!) but yes lots of wisdom. One has to have a separate informal session to discuss Taleb and his eccentric and wise ways. He indeed lives life in his own terms. Agree, Taleb is a heavy read. His books are interesting, at times beyond grasp, but very readable. I have not yet tried Infragility. Getting to meet Gods on investing and the foremost expert on behavioral science , Robert Cialdini in one single trip. Thanks for your efforts for making those notes. Wow Jana, must have been multiple dreams come true. A share can get you not just returns but so much to soak in to. Greatly thankful for sharing. I have saved all the book names and hope to be reading them soon. Thanks for sharing your experience with everyone. Thanks Jana.. for your graciousness in sharing your notes and various titles, Thanks Vishal for posting the same for fellow tribesmen.. Thanks a lot everyone for taking the time to read my experience. Thank you Jana for your willingness to share your amazing experience with all of us. Regards. What a great story. Would you mind sharing Cialdini’s advice on note taking and avoiding procrastination? Thanks for sharing your trip with everyone. Thanks to Jana, it was a vicarious pilgrimage to the most famous AGM! Very gracious of him to share the insights and to capture the ”átmosphere” at the meet. Hope it is a regular feature!! He was reading a research paper in the flight. He was taking notes on the material itself. After he completed a chapter, he pulled out a white paper and wrote a single page summary on what he read. He filed the page in a separate folder. This way he got his learning deeper and can refer to the summary in future if needed. He gave an example on how to continue writing blogs without procrastination. If you are writing about ‘Margin of Safety’ for example, stop at the paragraph which you know very well, what to write. This way you will come back to it the next day because of the urge to complete what you already know. This is the trick he uses for himself and I have been practicing it for the last 1 week and it is very effective. for describing such a wonderful trip to omaha….! i had got one query for you both, as i tried my best to get answer from local brokers and frnds…but they all failed…! how being an indian citizen & residing in india , i can buy berkshire hathway series B share…! I request all to please pen down their advise….as i plan to buy series B shares of Hathway….! There are a few brokers offering this service. ICICI Direct offers an american platform. So does kotak mahindra. There are a lot of caveats in buyng american and all non indian securities. We should definitely have a separate forum discussion for this subject. We need to be specially careful in considering the tax implications and find out about if India and Usa have a double tax treaty as potential gains may get wiped out in exchange rates and multiple taxes. your point well taken…i’ll check this at personal front and also dig in more with icici direct / kotak.